The ingredients to this are simple: Mineral oil, petrolatum, beeswax, ceresin, and Vitamin A. It makes short work of makeup removal--even heavy, waterproof formulas and tints come off very easily. I use a foaming cleanser afterward and then apply just the tiniest amount over my entire face and neck for skin which is akin to velvet. I am glad I read one of the reviews. I have sensitive eyes and it's hard to find an eyemakeup remober that makes me feel I am going blind. 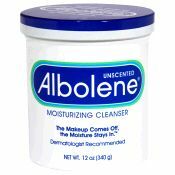 Well, I bought Albolene and used it my eyes and wow, what a difference!! I will use this forever. No problems with my eyes at all. I wouldn't use it on my face because it is very greasy, but it sure works on eyes. Try it!! It's not expensive and a little bit goes a long way in a huge container.